It is officially May 2015 and that means SUMMER IS COMING! You know what that means, a change of skincare and makeup routine to fit the sweaty, humid weather and don’t forget SUN PROTECTION! (Sunscreen police here) You guys know I don’t go ANYWHERE on a sunny day without my SPF. 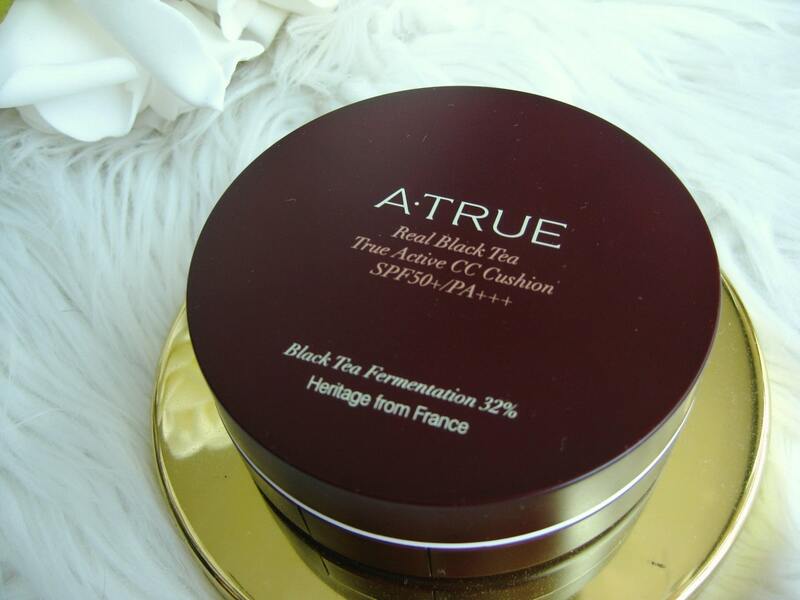 #skincancerpreventiontothemax So when I heard about the new ATRUE Real Black Tea Active CC cushion in SPF50+/PA+++, I knew I gotta review it. 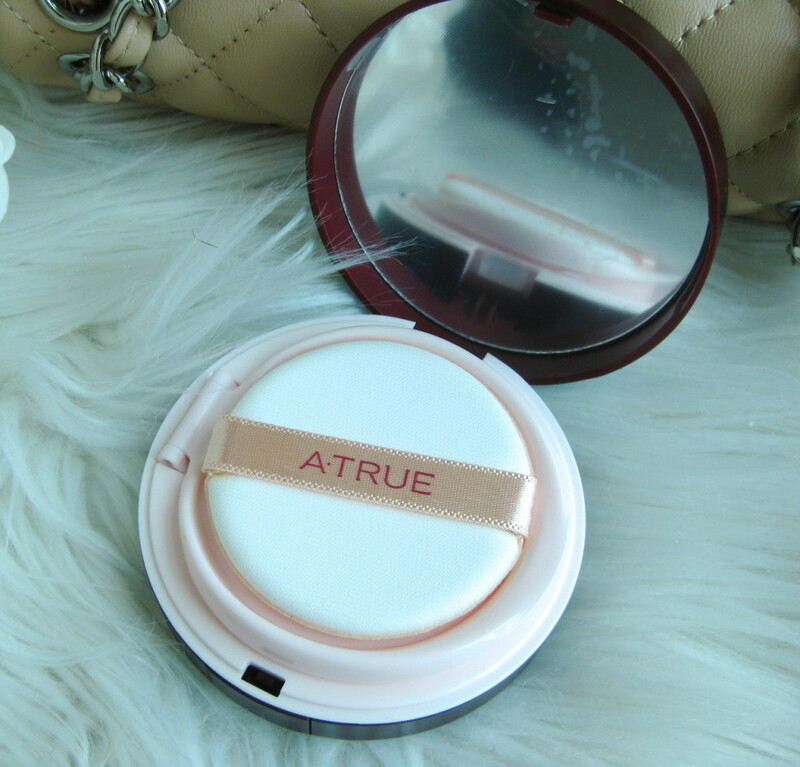 The lovely team at Cosmetic Love gifted me this CC cushion in the shade #02 True Beige for me to try it out, and I’ve gotta say I’ve never even heard of the brand ATRUE before this. 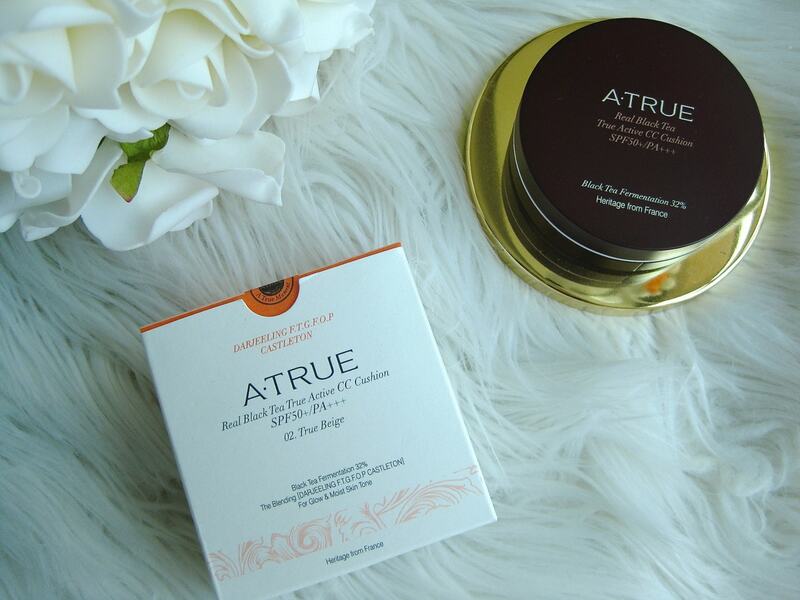 After some obsessive Googling extensive research on the brand, I’ve come to know that ATRUE is a mid to high end Korean skincare and makeup brand that uses real black tea extract from France. That being said, let’s see how this CC cushion did! I tried to educate myself on what exactly is Black Tea Fermentation 32% and the associated benefits, and got pulled into a whole other scientific toxicity/biochemistry realm. 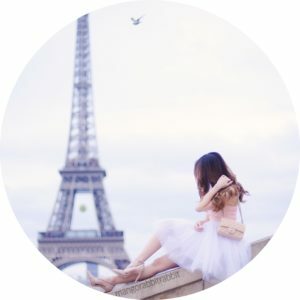 SO….. it’s apparently a multi-type procedure whereby fermenting the tea leaves helps bring out additional nutrients in the leaves that creates new active ingredients to help the skin in all kind of good ways and helps to rejuvenate and illuminate skin tone. This is what the packaging looks like after opening up the compact – it comes with a super soft sponge and a full round mirror and the sponge is separate from the actual product. If you’re familiar with BB cushions, this is exactly like that – just press the sponge lightly into the cushion and the sponge will pick up some product then you can apply it directly onto your face! 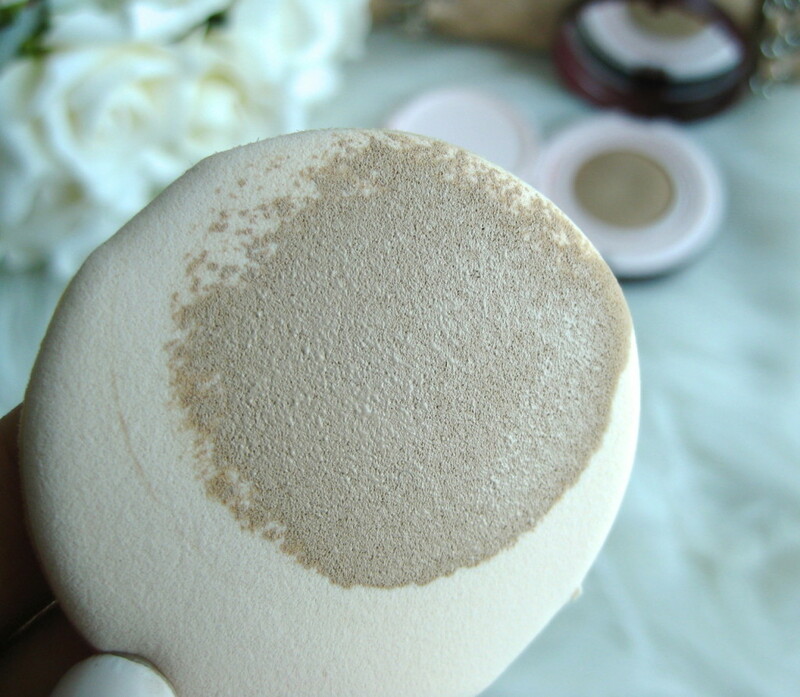 What the product looks like on the sponge – make sure you apply it to your face right after you picked up the product, otherwise the sponge might “eat” up some of the product! I simply use a patting motion when applying it to my face. The sponge applies the CC cream to the face in a very smooth and even way and is evenly distributed when I blend it out with the sponge. This product smells like an exact mix of baby powder and roses in an unpowering way, which isn’t necessarily a bad thing but maybe not for scent-allergic people. 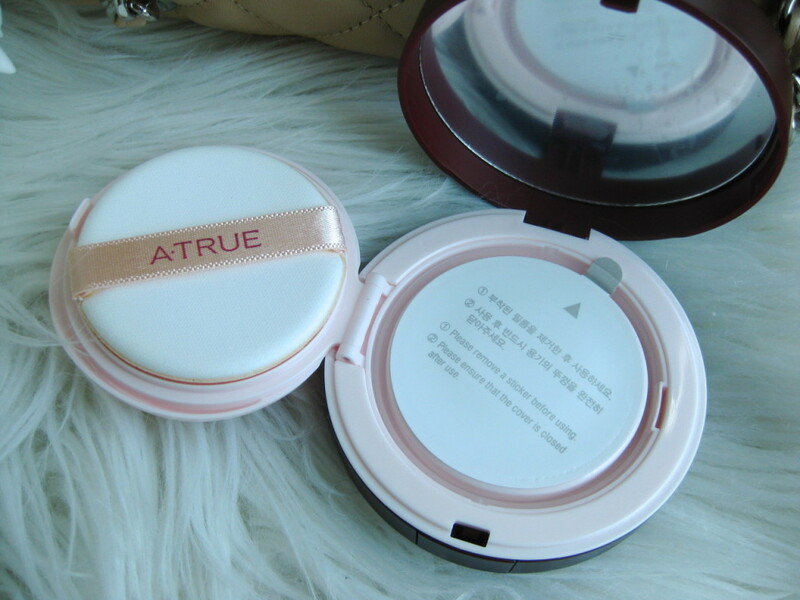 I want to give ATRUE some props for coming up with a CC cushion (remember all the BB cushion hype when it first came out? Well now it’s the CC cushion era). 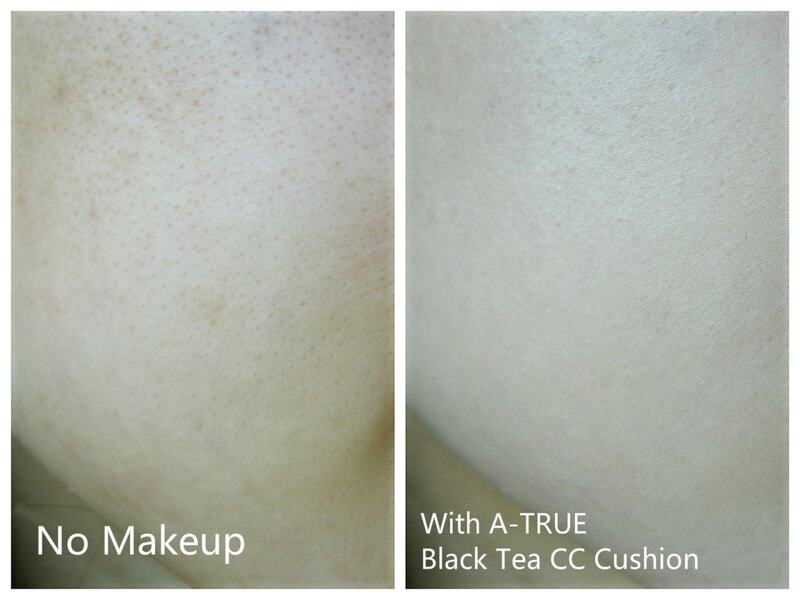 What’s impressive about this ATRUE CC cushion is that its coverage is even better than some of the BB cushions out there (cough cough holika holika), and the shade 02 True Beige fits most Asian skin-tones pretty well, unlike some BB creams that tend to give that ghastly grey cast….. O.o not attractive. It’s not a very high coverage product, but it’s definitely very buildable and breathable. I can just wear this on its own with some concealer on my panda eyes and i’m good to go! I have used this CC cushion consistently for about a week now, and found that it lasts a super long time. I don’t know why, but it just doesn’t tend to slip and slide around my face unlike some liquid foundations do, especially when the weather gets hot. I also layer a transculent powder over the CC cushion so that definitely helped it stay longer too. Okay can we just take a moment to appreciate the SUPER HIGH SPF OF 50?!?!? Sorry for yelling but I am too excited for this. I am all for efficiency – so this to me is like a dream come true. 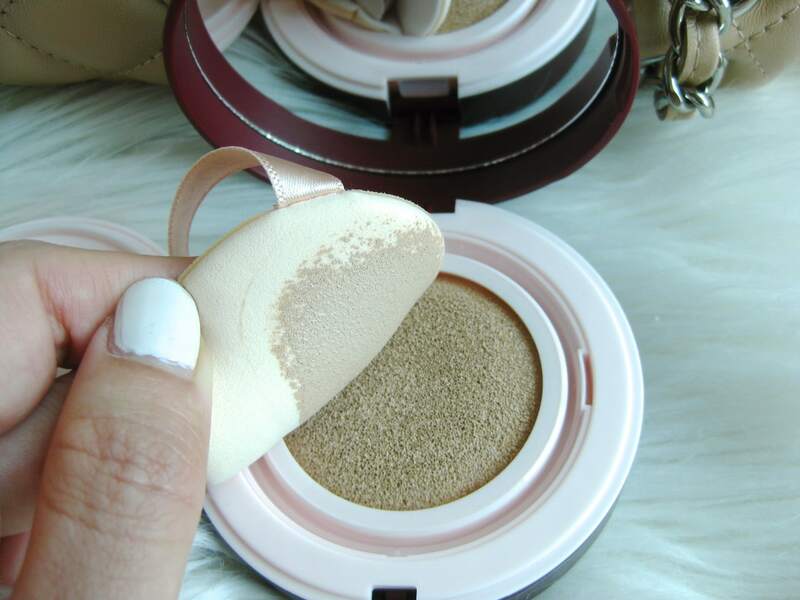 A long-lasting , medium coveraged CC cushion with skincare and SPF benefits that is not sticky or makes me look like a ghost?! I’m all for that. My overall impressions of the ATRUE Real Black Tea Active CC cushion in SPF50+/PA+++ has been nothing but positive, and it’ll definitely be my go-to product this summer! 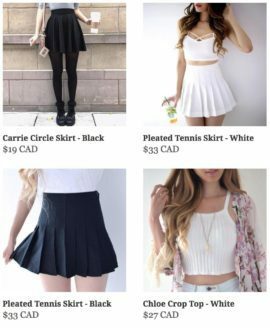 If you’re interested in this product, you can buy it at Cosmetic Love who offers Free Worldwide Shipping!